This is my first Weekly Photo Challenge post – the theme for this week is ‘change’. I decided to go with the seasonal aspect of the challenge, because I am THAT excited about this finally being the weekend the parka heads out of my life and into the dry cleaners’ capable hands! 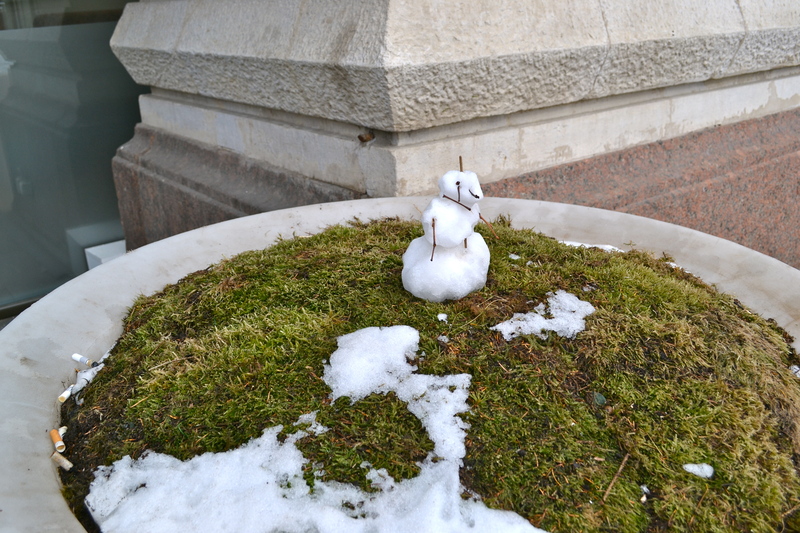 I came across this tenacious snowman on a recent trip to Moscow, outside the GUM shopping mall next to Red Square. I don’t think he’s long for this world, and I’m hoping the sun’s going to win this fight (though I’m sure he’ll be back with a vengeance next year). ‘Change’ can also aptly describe the city of Moscow itself, from the reign of the Romanovs to the terrors of Stalin to Putin’s vise-grip hold on power…but that’s a whole other story for a different photo challenge! This entry was posted in Uncategorized and tagged Moscow, postaday, Red Square, Russia, spring, Weekly Photo Challenge, winter on April 12, 2013 by CatherineTs. Even though Spring is taking a long time to arrive! That’s a perfect picture for “Change.” I love your shot of the Thames as well. Love city, London. Thanks, Catherine. Nice of you to stop by. I just started doing these weekly challenges and it’s a great way to meet people and see lots of wonderful photos. Absolutely – it’s amazing to see how many beautiful and different interpretations there are out there of one simple word! My favorite view of London is off a bridge near Westminster looking down the Thames 🙂 And you’re so right about the Starbucks – you have to actively seek out the tea shops, but that can be a good thing bc it means they’re not too overcrowded! Are you a tea drinker? I love tea, have about 40 kinds and drink it virtually every day. The first time I was in England, in the mid-70’s, I’d never drunk tea but since it was the high test, sit-on-the-stove-all-day type of tea, I had to drink it with lots of milk to start with. 🙂 Now I never take milk in it. I am! I’m envious of your stash – in traditional London style, my kitchen isn’t very big, so I’ve been designated one single tea drawer (I’ve managed to fit about 10 in there so far :P) I never take milk either – which my colleagues at work can’t understand! Perhaps one day we’ll be able to share a cuppa! That would be fun. Do you have any flowering teas? They’re so much fun and so beautiful. I bought a glass teapot just so I could make them. Definitely 🙂 I don’t have any actual flower blossoms – must get on that – but I do have a milky oolong that takes on a life of its own! That’s really sweet how you’re so concerned with the poor little melting snowman… 😉 I can almost hear him moaning “I’m melting! I’m melting!” aw, poor little dude. Beautiful. Soon Winter is but a memory and Spring’s colors will fill the landscape around you.